Elias (Joe Paulik) in A.C.T. 's 2017 production of John. Photo by Kevin Berne. We found out that many of the period houses in the town were used as Civil War–era hospitals. The townsfolks’ homes were put into service to treat the staggering numbers of wounded soldiers. We visited a woman who showed us a bloodstain on the floor of her house—the blood had seeped so deeply into the wood that it was still visible. Annie Baker has been closely involved in the design of this production. What has that been like? It’s unique for a playwright to feel such a faithful obligation to the tone of the thing. In the design process, Ken and I have been very involved with Annie. I’ve shown her the model and then different wall treatments. One of the features of this play is the uncanny and real things turned strange, so I feel responsible to create the kind of atmosphere in which that can happen. In other plays you can make theatrical shortcuts, still creating realism, but it’s a theatrical version of realism. When you see a living-room set in American theater, it’s unusual that you would have a ceiling because of budget constraints and because a ceiling often requires other ways to consider theatrical lighting. That’s just a vocabulary that’s become normalized in theater. And so the audience readily accepts it. But Annie’s plays make different requirements of the creative team. She’s interested in a very particular kind of real realism. You see it in the language, the way that people take pauses, and the length of her plays—because they’re not condensed in a theatricalized way. She’s interested in the way that time happens in real life. John runs through April 23 at The Strand Theater, 1127 Market Street. Click here to purchase tickets through our website. 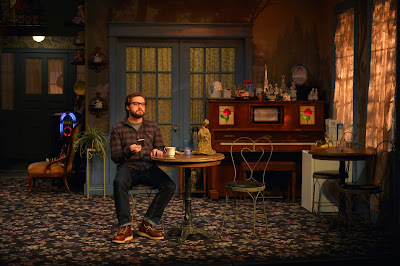 Want to know more about Annie Baker, the set, or Gettysburg? Click here to purchase Words on Plays, A.C.T. 's in-depth performance guide series.